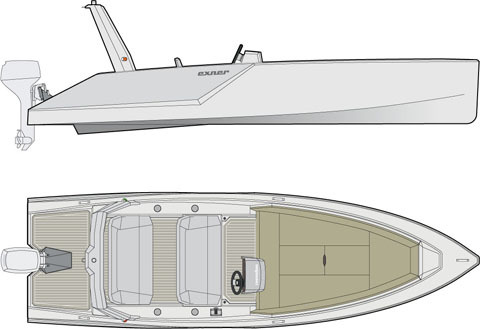 Cosmo6oo is a pleasure craft with electric drive – the fascination of the speedboat experience combined with its special form, design, innovation, equipment and comfort with a friendly energy concept, sustainable technologies and intelligent solutions. Cosmo600 is quick and due to the electronic drive almost silently. But even if Cosmo6oo represents "Power and Style“ of speedboats, she is also an incredibly friendly boat that loves to swing among water lilies and combines with the grandeur of our seascapes. The combination of several technical aspects Cosmo600 achieved a hitherto unseen dimension to the efficiency of the handling characteristics. The new lightweight construction of the hull, used in rigid foam panels, which were originally developed for the aircraft industry, as well as the hydrodynamic calculation of the hulls shape are precisely matched to the power of the electric engine. The chosen engines are characterized by extremely economical energy consumption, which only requires a small battery capacity. New equipped with the new ‘Green Flash Outboard’ by Aquawatt, a masterpiece of electrical engineering, Cosmo6oo accelerates to more than 30 knots! For the distance of 22km Cosmo600 requires not more than 24 minutes! The range of water sports that can be played with Cosmo6oo, now extend over wakeboarding through to monoskiing! The chosen engines are characterized by extremely economical energy consumption, which only requires a small battery capacity. 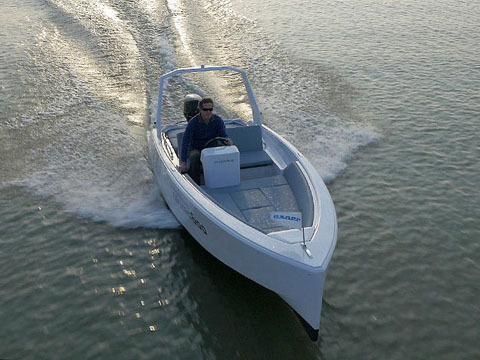 For all boat lovers who are looking for design affinity and energy-conscious concepts combined with elegant décor, comfort, dynamic handling and high speed.